The candlelight vigil was organized in honor of the tragic Monday shootings at Virginia Tech in Blacksburg, Va.
Chancellor Harvey Perlman, Vice Chancellor of Student Affairs Juan Franco, ASUN President Dave Solheim and Bill Velander, chairman of the chemical and biomolecular engineering department, addressed the large group that filled the entire space between Broyhill Fountain and the Nebraska Union. Even after the candles were out and the speeches were complete, many students remained in the plaza consoling each other, signing a card for students at Virginia Tech and forming prayer circles. The card will be in the Nebraska Union for the rest of the week and will be shipped to Virginia Tech along with cards from hundreds of other campuses around the United States. For many present, the gathering was a chance to show support for those affected by the murders, as well as a way to cope with the reality of such a shocking event on a college campus, Solheim said. "(This tragedy) means a lot to this campus and to Virginia Tech," he said. "The purpose of this evening is remembrance, so people can cope and support their friends and show support to those affected by the incident." 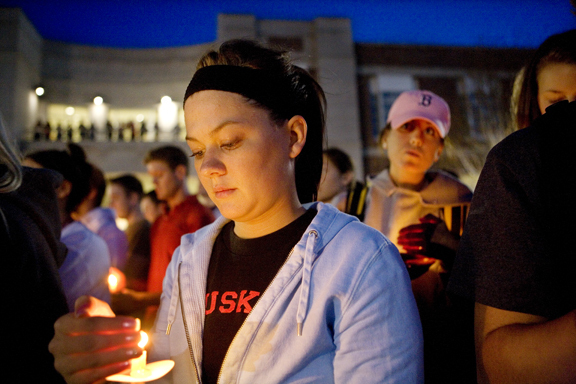 Many students attended the candlelit event, but Solheim said he knows that many other students at UNL are coping with the images of the shootings in their own private way. For Velander, the tragedy has very personal connections. A former faculty member at Virginia Tech, Velander has many friends and colleagues still in Blacksburg. His daughter is attending medical school at Virginia Tech. "It&#39;s a great place, just idyllic," he said. "That&#39;s what&#39;s so frightening. If it can happen to such an idyllic, golden, amazing place, it can happen anywhere." Although the event touched him personally, taking the lives of two of his colleagues, he stressed that people, especially students, all over the country should take note of the tragic event. "Anybody that has a father or a mother or a sister or a brother is affected by this, because these are the kinds of people who died," he said. "That&#39;s so many broken hearts. That&#39;s hundreds of broken hearts." Vigils like these are positive experiences in the wake of such a dark moment in history, he said. The events may be tragic, but the number of people willing to show support gives Velander hope that this generation is willing to make positive change. "If there&#39;s anything positive that can come out of this, it&#39;s that young people can see such a tragedy, recognize the problem and work within society and solve it," he said. "There&#39;s a heavy burden on students who have witnessed this either through the news or in Blacksburg. We have to realize when someone is down and work until they&#39;re up again. We can&#39;t let things like this happen." Marypat Heineman, “Vigil commemorates Virginia Tech tragedy,” The April 16 Archive, accessed April 24, 2019, http://www.april16archive.org/items/show/1283.